A new reading program supporting early literacy is coming to Van Horn Elementary School thanks to a Read Big Bend grant from the Permian Basin Area Foundation. The grant will go toward new books, materials, and program support for “Read Van Horn, Eagle Style,” and volunteers are needed to read aloud to small groups of students each week. 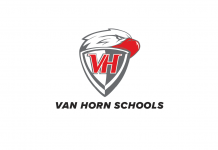 Read Van Horn begins February 19. Volunteers will spend thirty minutes reading aloud to students in PreKindergarten through second grade, on a day and time that fits their schedule. Read Van Horn hopes to inspire a love of books, share reading as a fun activity, and motivate young students to want to learn to read themselves. Elementary Principal Charles Gonzalez is working with his elementary teachers, library staff, and Read Big Bend to bring the program to Van Horn. “Reading is a key factor to any successful education venture or professional career,” said Gonzalez. While the pilot program will begin by focusing on the youngest students, the school will consider adding more grades in the future.